Yesterday's live-action Captain America concept art gave us hope for the next Marvel properties getting the movie and video game treatment. 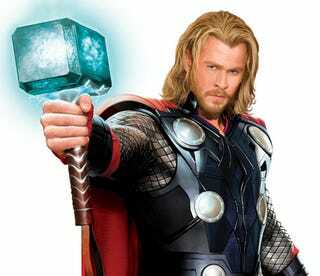 Today's Thor concept art takes a large hammer to that hope. Yesterday Ain't It Cool News delivered a set of images purported to be concept art for the upcoming Captain America movie, which of course also makes them concept art for the video game Sega will deliver to coincide with the movie's release. Now Collider.com digs up a couple of similarly-styled concept art pieces showing off Chris Hemsworth as The Mighty Thor. We've previously seen an official teaser image of Hemsworth in full Norse regalia, but this is the first time we're seeing the full outfit, complete with glowing blue Mjolnir (pronounced myol-neer), plastic replicas of which are sure to start showing up at toys stores months prior to the movie's May 6, 2011 release date. Perhaps it's the faux scale-mail sleeves, or the random rubber-looking bits around the boots that don't seem to serve any real purpose. Maybe it's the fact that the Norse god of thunder needs to wear boots with jagged hiking soles. 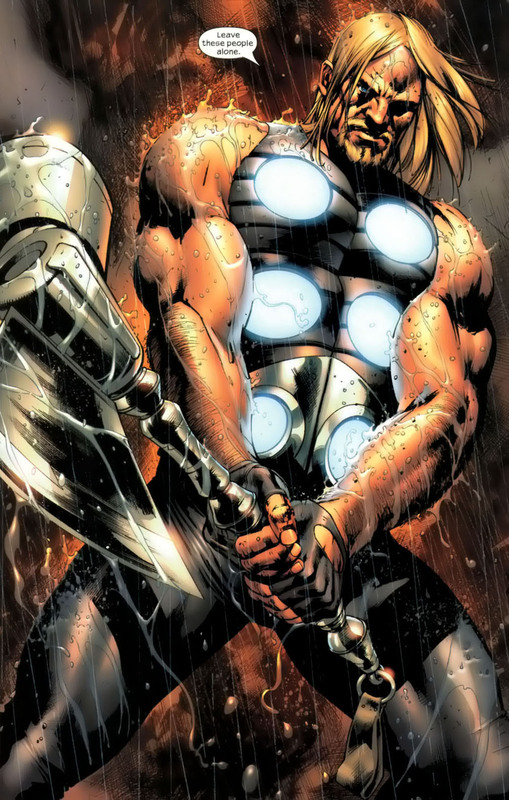 It could be I've just been spoiled by Bryan Hitch's simple design for Ultimate Thor, who was just a big guy in a stylized muscle tee with a fancy belt. It's just not screaming Thor for me. Try this. Put the full-sized image on your computer screen and take a few steps away. Squint your eyes. That could be anyone. Hell, it could be blond Magneto. Ultimately, I am not a film director, so what do I know? With Kenneth Branagh handling the directing, Natalie Portman as Thor's human love interest, and Anthony Hopkins as Odin, this could be the most spectacular Marvel movie ever created. Hopefully the status quo will be maintained. Marvel will continue to deliver solid movies, and Sega will continue to turn them into mediocre games.